has been released on SynGate records! It's an album in pure Berlin School manner, lots of sequences (and arpeggios, for those who like it accurate ), the usual few minor chords, Space sound effects and a healthy dose of synth soloing on top of that. ...plus one or two gimmicks here and there to keep things (hopefully) interesting. I see it as a somewhat darker, more monochrome companion to last year's "Trees of Olivandá" (...if You happen to know that one). First review of "During A Lull And Other Tales" by Sylvain Lupari for his online magazine "Synths&Sequenzes". "This is another very good album from Michael Brückner..."
Find the original review (in German) here, or my (rough) English translation below. Everyone else's opinion to the album is welcome, too, by the way (no need to hold yourselves back ). Thanks! 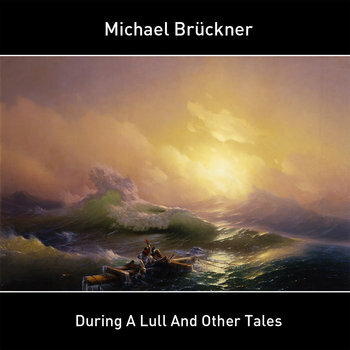 Michael Brückner's "During A Lull And Other Tales", unlike many other works of the Mainz based musician, was released on Syngate - and as with his previous release on that label, "Trees Of Olivandá", it can be assumed that this album once again shows a comparatively accessible, if not commercial, side of the electronic musician. And Brückner himself even agrees with this assumption when he writes in the info text to "During A Lull And Other Tales" about "(almost) pure Berlin School", puts artworks borrowed from Caspar David Friedrich and contemporary painters into this context, and calls the album at the same time "a slightly darker and more monochrome brother to last year's 'Trees Of Olivanda'". And yes - the music fully lives up to these conditions. The basic structure of the six pieces (buyers of the digital version subtitled "XXL" also receive a 22-minute "Space Jam" as a bonus) are indeed created via sequencers, over which synth pads are layered, mostly imitating strings or wind instruments. In addition, there are solo lines that introduce melodic fragments or are actually soloing. Well, also the negative things that have occasionally been said and written about the time-honored Berlin school electronics apply to "During A Lull And Other Tales": Here, too, changes take place only slowly, if at all, there's a lot of repetition, and often the music simply "stands (still)", and unlike with some more modern representatives of the style such as Sankt Otten, there are hardly any through-composed melodies. But nevertheless: Even if the existing variation in the music is mostly limited to the sound or the texture, the material on this album is not simpler than on the possible great idols of the 70s and 80s. In addition, Brückner also manages to do two things quite well, some of which even set his music apart from familiar classic electronica tropes. The one, to which the latter is less true, encompasses the tension and variety of the individual pieces among each other. For example, the cheerful "In The Springtime Of Our Lives", arranged light as a feather almost without deep notes, with its somewhat bumpy sequence and sounding like a twisted version of Kraftwerk's "Europa Endlos", stands between the futuristic-mechanical sounding "La Femme Derrière La Lune" (including vocoder-alienated samples in French - compare "The Day After X" by Robert Schroeder) and the much darker quasi-titletrack "During A Lull", which focuses on lamenting melodies and deep booming bass rhythms and also interjects some set pieces from Brückner's dark ambience works. Apart from that it's also interesting that Brückner sometimes puts the rhythmically moving passages, which of course are achieved by the use of a sequencer, into the background and instead emphasizes the voluptuous floating surface sounds - thus creating a certain dynamic as well. The other peculiarity which needs to be menitoned, is that Brückner didn't record a retro record. The employed electronic instruments sound very modern, actually only the basic concept makes references to tradition. This in turn also means that Brückner doesn't shy away from contemporary rhythms: "During A Lull" and "Daphne" use harder beats at different times, bordering on techno and related stuff, which then, piquantly enough, are even put into the service of dynamics, providing even more movement and intensity, if not excess, thus themselves adding to the creation of structures. So it's twice as good that Brückner tends to look beyond his own nose, and that's exactly what makes up a big part of the appeal here. And the other one: Although the rest of the songs are very well done, the concluding "Votre Coeur" fails to keep up. Although the sequence develops quite some drive, there's not enough happening beyond that in the long run. All in all, however, Brückner maintains a remarkable level on the album, which is already quite long, and which, as already mentioned, doesn't sound out of date despite references to the past. So, "During A Lull And Other Tales" definitely deserves a recommendation.